Automatic drilling and automatic sawing. Saw blade horizontal working allows large cutting width. 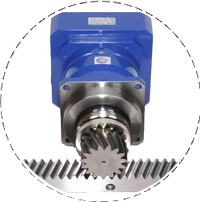 Ball screw is driven by servo motor for high accuracy. (Transmission through precision ground rack is available). Equipped with Mitsubishi: NC control. PLC features extremely stable control performance. Employs CE certified control components. Two sets each of held-down clamps and horizontal clamps provided on the feeding system permits cutting of irregular work piece. During operation, the machine provides detection for lock of material. Available to set tail length to be cut. Maximum feed speed is of up to 60 m/min. 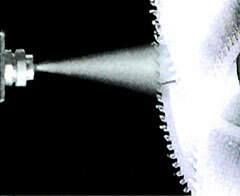 Maximum cutting rate is 4 seconds for one cutting. Variable spindle speed ( RPM ) Accommodates saw blade form 10" to 24"
Saw blade feed motion diagram optional motion. two speeds 5000 / 2400R.P.M.